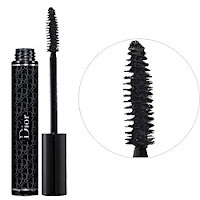 One of my must have products is DIORSHOW Black Out Mascara. This mascara will make any man black out with one flutter of your eyelashes. This rich mascara make lashes so full and thick with ultra black kohl pigments, it appears as if your wearing false ones. This is said about so many mascaras out there now but this one is a true staple for any cosmetic bag. I swear by it. In fact, I am going to purchase a new tube today! Drama, drama, drama. *Always change your mascara at least once every three months.